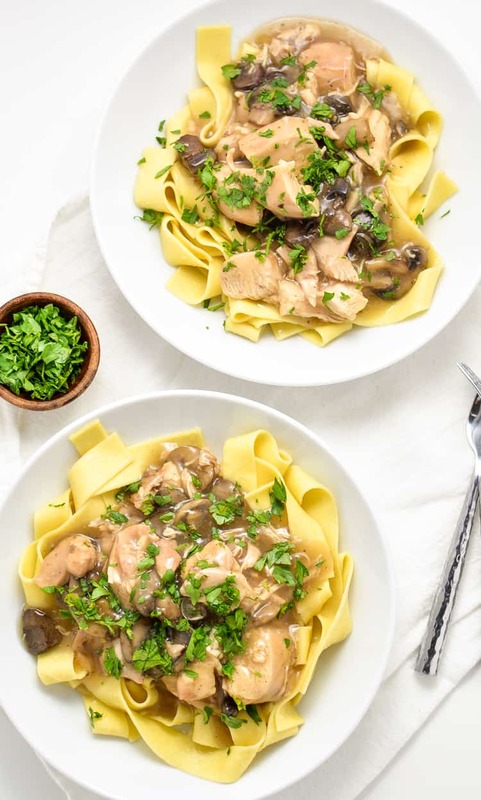 Almond Chicken and Mushroom Casserole is a super simple weeknight meal that the whole family will go crazy for. 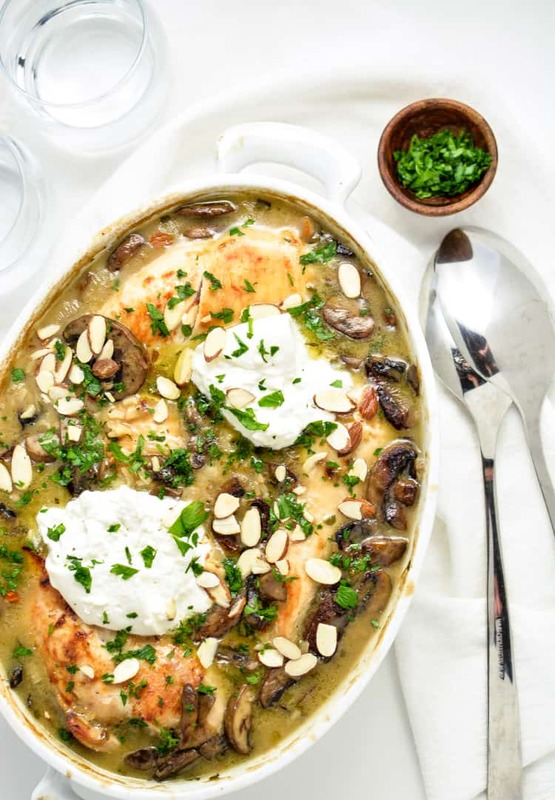 Chicken breast sits on a bed of wild rice that has been mixed with mushrooms, cheese, and an addicting savory sauce. 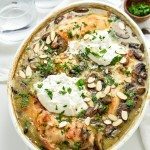 After it is dolloped with fresh burrata and roasted almonds, this casserole is on the table in under an hour of cooking time, leaving more time to enjoy with your family and less time cooking in the kitchen! It is a must-make recipe for this winter season! Happy Thursday Melrose Family readers! Justine from Cooking and Beer here! Is everyone getting ready for the big day? You know which day I’m talking about. That day that we have been preparing for since LAST November. It’s almost Thanksgiving time! What? You guys don’t do that? Seriously, I have been planning for Thanksgiving since last year’s Thanksgiving. You know. You have to record what went right and went wrong in a nifty little notebook, so that you know what recipes to repeat and which ones to toss. I’m a little bit of a crazy person when it comes to planning ahead, but I think many of you can probably relate. Speaking of relate, I’m sure you guys will be ready for some super easy recipes once the holiday comes to an end. 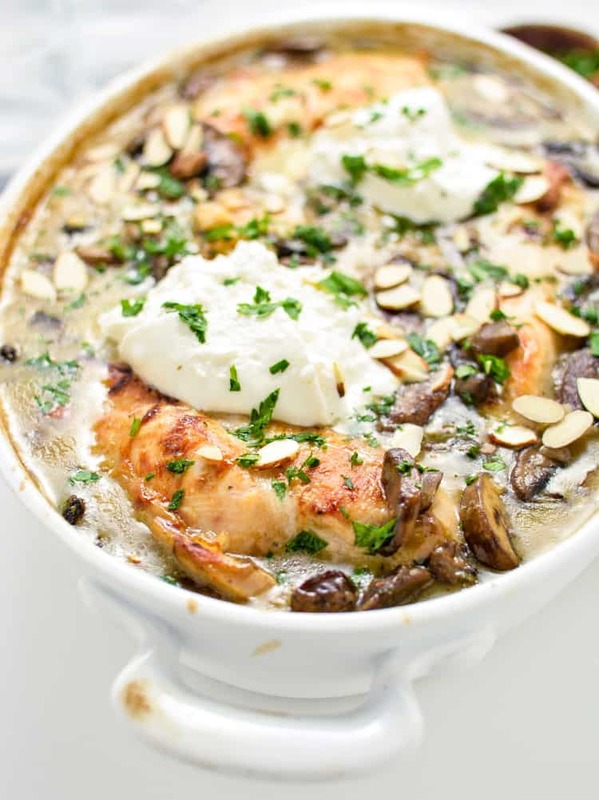 This is why this almond chicken and mushroom casserole is one of my favorite weeknight meals. 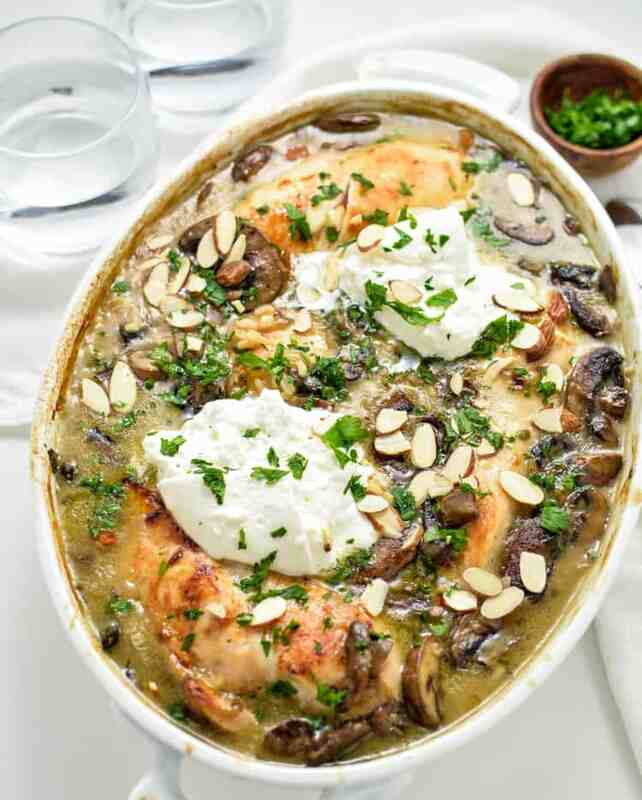 Once you put away the fine china…and once you have used up the last of your leftovers making turkey casseroles and butternut squash enchiladas, it’s time to bust out the easy recipes. I feel like easy weeknight recipes get a bad reputation sometimes. It’s hard to get all of that flavor into a dish that is whipped up so quickly. It’s also difficult to jazz it up. You normally use what you already have on hand. There’s not always a whole lot of planning going on. It doesn’t have to be that way. 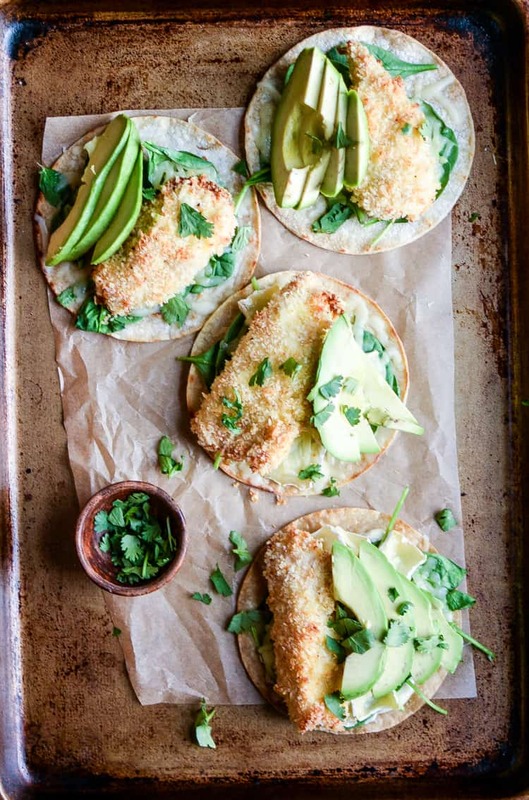 Weeknight meals can be just as delicious as those that you go crazy over on Saturdays and Sundays. I’d like to think of this casserole as a dish you could find at a restaurant. I would honestly be super excited if I could order a casserole at a restaurant. Someone should do that: open a casserole-themed restaurant. You guys get on that and let me know how it works out. 😉 In all honesty though, this dish tastes like it came straight out of a restaurant kitchen. It packs so much flavor for a dish that doesn’t take very much hands on time. I hope you guys enjoy this recipe as much as we do in my house! It’s a staple around here, and I truly hope it makes it into your menu plans sometime soon! Have a wonderful Thanksgiving, everyone! Preheat your oven to 375 degrees F and spray a large baking dish with nonstick spray. Set aside. To a large saute pan, melt 1 tablespoon of the butter over medium-high heat. Add the chicken breasts, and cook for about 3 minutes on each side or until golden brown. Remove from heat and set aside. The chicken will not be cooked through completely. This is OK. Melt 2 tablespoons of butter in a large saute pan over medium heat. Add the shallot and cook until tender, about 4 minutes. Add the mushrooms and cooked for about 7-8 minutes, or until tender. Stir in the sherry and cook for an additional 2 minutes. Next, add the flour to the pan. Stir frequently, until the flour is golden, about 2 minutes and then slowly whisk in the chicken broth. Cook for about 6 minutes more until thickened and then remove from heat. To the pan, stir in the rice, parmesan and 2 tablespoons of parsley until fully coated. Season to taste with salt and black pepper. Pour the mixture into the prepare baking dish and place the chicken on top. Bake the casserole for about 40 minutes or until that chicken has cooked through. Remove from heat and garnish with roasted almonds and additional parsley. Dollop with fresh burrata if desired and enjoy! Like what you see today? 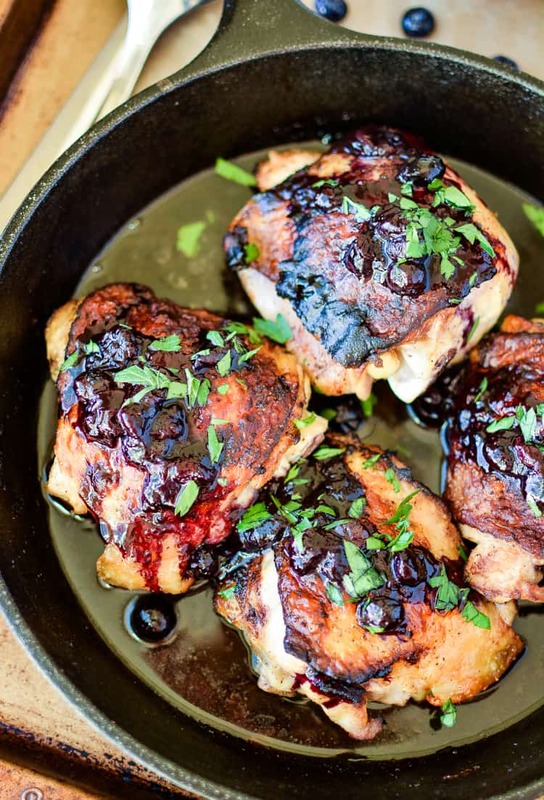 Check out some other chicken recipes found over on Cooking and Beer where I’m combining bold and inspirational cooking (and baking) with the best craft beer I can get my hands on! Don’t miss a post! Follow Cooking and Beer along on social media! Wow! This looks amazing! Pinning! These permit the gasses to vent without allowing fresh air back in, which is the most fundamental part of making charcoal. period of time compared to happens when smoking a cigarette.